I have just heard a blood curdling scream from an adjacent cell caused by the appearance of a most horrific apparition: a non-alcoholic whisky! It is produced by "Scottish Spirits Ltd.", a Panama based company run by a family called "Katz" (1,2), who claim to turn out more than one million cases of "Scotch whisky" a year (ahem, ahem). Their revolutionary brand seems to have more than one incarnation. As well as "Black Zero", they also make "ArKay", a non-alcoholic whisky which "is specifically targeted for Muslim consumers worldwide since it is Halal approved. ArKay non alcohol whisky tastes and looks exactly like traditional Scotch Whisky. It is suitable for drinking straight up or with soda, tea or other mixers. ArKay is the result of 10 years of research and development." The minimum order is 1,200 bottles. I hate to break it to the Katz family but, as usual, the Japanese are way ahead in these sorts of heresies. Step forward "Maboroshi no Sake Hoisu", which roughly translates as "Illusory/dreamy alcohol Hoisu." It was invented way back in 1955. 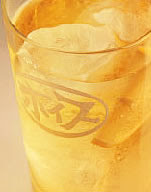 During in the golden age of Japanese whisky drinking, between the 1950s and 1980s, everybody wanted to drink a whisky high ball. 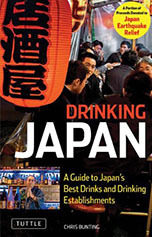 While I was researching for my book in Osaka recently, Eiji Eigawa, landlord of Torys Bar in Juso, told me: "The boss used come in and order a high ball. Then, everybody with him would order a high ball, right down to the newest guy in the office. It's not like that now. The youngest guy will order a single malt". 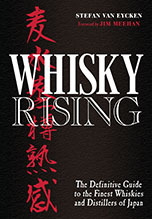 However, at the beginning of the high ball era, your average Joichi could not always afford proper whisky. Which is where "Hoisu" came in. Basically, it was a high ball mixer. You just stuck in some super cheap korui shochu and you had a "Hoisu-ky high ball" without any need to get involved in that peskily expensive foreign spirit. 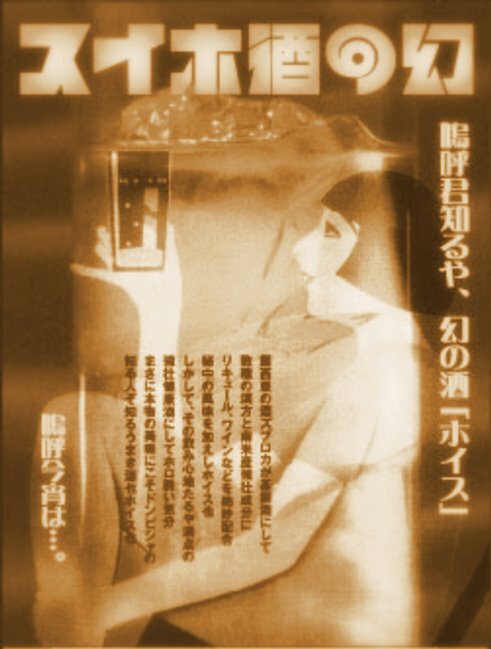 When the Japanese started earning a bit more cash they fell out of love with their grubby old consort but it has recently enjoyed a bit of a resurgence, along with everything else "Showa retro". There are whole magazines devoted to the bars (1,2,3,4) hawking this sort of stuff. I should also mention "Hoppy", a retro "beer" mixer that has become really big in recent years. The company that makes it saw sales more than double to ¥2.33 billion a year in the five years to 2006 and you see its flags all over the drinking districts. The irony is, of course, that the "nostalgic" 20 and 30-somethings that are fueling this boom never actually experienced what they are pining for. I love these layers of facsimile and fake. Superb piece, Chris. The nightmare continues :). BTW, I just realised that I don't yet have a link to you on my site, for which apologies. I will rectify this immediately. Oh, boy! I should have known that the y had this non-alcoholic drink way back since 1955. I would've stocked on half a dozen bottles per month and indulged myself during my carefree time rather than stick to juice or light beer. Hoppy. Man, that is some nasty stuff. They've got a few incarnations out in stores and they are all pretty awful.